What does my order consist of?Your order consists of your design document (created by you) showing all measurements, hardware, and finishes along with your Paypal (credit card) proof of purchase and order number. That design constitutes the product(s) that will ship to you. If you've made requests for features via email, and they do not show in your design, then they are NOT a part of the order. What happens after I pay? About every 3-4 days you'll get a status from us on your gate or kit's progress. You get a UPS tracking number at shipment. Oops! I made an error in ordering!! You have 36 hours to cancel your order (with full refund) or make any little tweaks you may have forgotten to do! We'll send you a revised design document with each revision, so we're on the same page. If your revision has caused a price change that you do not wish to accept, you may cancel with full refund within this 36 hour window. What payment methods are accepted? We accept all major credit cards through PAYPAL. Orders paid by company check or personal check or money order may incur additional delays. Such orders will not be processed until the check clears. We will also require your signature on the approved design. Are their situations where this gate is not recommended? Do not use the gate as a restraining device holding back larger children or adults. A determined individual can lie on the floor, and beat the slats with their feet, and eventually pop out a baluster. We have had NO reports of this ever being done by any animal, only one adult in a special needs home, over ten years. Are these child rated? These hinge-mounted gates are inherently safer than slide-in or freestanding gates. See our how to order page for all the safety features. Nonetheless, these gates are NOT rated as child safety gates by ANY independent testing service; use at your own risk. See additional terms of sale, at bottom. Applies to all Sales: The customer is solely responsible for the suitability, fit, operation and maintenance of their gate. Gates2U bears no liability for the function and operation of the gate. Customer accepts all responsibility for the installation and fit of their gate. 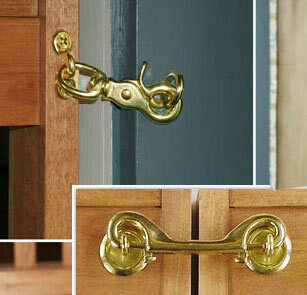 Custom accepts all responsibility for upgrading the latch to meet any safety requirements that they may have. Customer accepts that Gates2U makes no representation of suitability of this gate for any application. The customer is solely responsible for the safety and maintenance of this gate. Customer releases Hebell LLC from any and all liability associated with use of this gate. By ordering, customer agrees to limit any claims against Hebell LLC (Gates2U) to no more than the purchase price of the gate/kit/plans, plus shipping and tax (MD sales tax only). Web Site Errors. We reserve the right to correct any rare pricing errors or other errors on our website. If you've placed an order and there is an error in its price, we will give you an opportunity to accept the correction, or we'll refund your order in full. Obviously, for small errors on our part, we'll absorb the mistake ourselves! This is for the really big goof. When do you ship? All interior gates and kits are guaranteed to ship 2 weeks after you have approved your order and remitted a form of payment. Deck gates ship in 10 days. Unfinished gates and kits, however, generally ship within 9-10 days. How do you ship? We ship UPS GROUND. We have pre-approved our packaging methods with UPS. If you notice any damage in transit (occurs about twice a year, usually when a gate has suffered a forklift injury at a UPS hub - a rare event! ), please call us immediately! We'll work with you to get a UPS CLAIM placed, and then quickly replace the gate or handle any refunds in parallel. Do I need to be home? If we're shipping to your billing address, you don't usually need to be home. We do request signature for alternate ship to addresses, as well as when we anticipate exreme weather in your area. We reserve the right to request signature at our discretion. Do you have discounts? 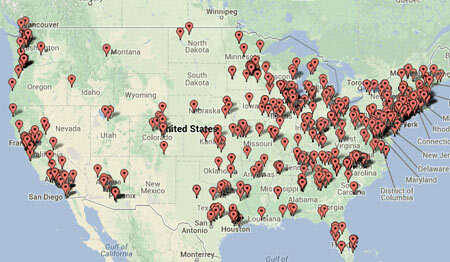 We typically offer 30% UPS retail price shipping. 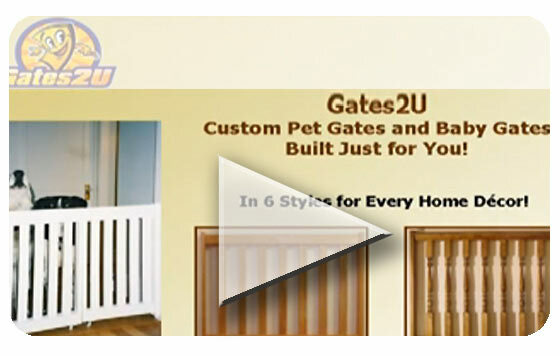 When you get your gate design, the current shipping discount will be shown in your online quote. Do you ship to Canada? Yes! We deliver via UPS Standard to Canada, UPS GROUND to the continental USA and via UPS 2nd or 3rd day AIR to Hawaii or Alaska. (When checking out, your Hawaii or Alaska shipment method will show GROUND - GROUND is used for transport in the USA and AIR completes the transit to those locations.) All shipments to Canada are ground based. Are there extra fees to Canada? Yes! In your online design and quote , you will see the UPS STANDARD quote, plus a Canadian Entry Prep Fee, plus a total of 14% in taxes (brokerage fees, CA disbursement fees, plus CA VAT taxes. No duties apply). We pay these costs on your behalf because UPS bills us for them. Can Gates2U cancel my order before shipment? Yes, though most commonly it is because of perceived credit or fraud risk, or (rarely) becauase the customer is ordering a gate for a situation which we believe will be dangerous or lead to failure at install. If we cancel, you will be refunded in full. This happens extremely rarely, thank goodness! We reserve the right to refuse service to any customer. Can I cancel after ordering an assembled gate? Within 36 hours of ordering, you can make changes or cancel completely. If you cancel your order in that period, you'll get every nickel back. If paying by PAYPAL you will get a full immediate refund. If paying by separate credit card, you will have NO charges to your card and NO authorizations. After that 36 hour window passes, though, full charges apply as we're cutting and staining or assembling your wood. This policy applies to both finished and unfinished gates. Can I cancel after ordering a gate kit? If your gate kit is unfinished, you can cancel at any time before shipment. For kits with stains or paints, however, you must cancel or make changes within 36 hours after ordering. If you cancel your order in that period, you'll get every nickel back, as for assembled gates above. Can I cancel after ordering gate plans? Downloads are instant and cannot be refunded. Can I get a refund? Gates, kits and plans are non-refundable items. If you believe we've done something wrong, though, by all means contact us and let us make it right for you! Your satisfaction with the product is our number one concern.